Elsie is 1! Come and Celebrate with us! As you may know recently we have been struggling to get the numbers of quality projects that we need to make ELSIE panels interesting and worthwhile. Consequently numbers attending have been falling away. There are a number of reasons for this, including a number of new ‘self help’ projects that involve eating pies, willing skills, views from valleys etc. Also without a ‘coach’ we are unable to work with enough projects to ensure that they are ready to come to panel – so we have ended up doing some really basic business advice – which is not what the Elsie panel is for. So we find ourselves at a crossroads. Do we push on to the next stage, which for me would involve recruiting a coach to work with people doing good stuff in Leeds free of charge, and bringing those that would really benefit to the panel when they are ready. Or, do we knock ELSIE on the head knowing that over the last 3 years she has helped hundreds of people, both clients and panel members to feel better connected and t et the support that they need in what can feel like a lonely city – especially for those unable to pay for their advice and support networks. Or perhaps there is another option? If so I would love to hear it? Click the Owl to join us! Just click the pic to find out more…. A Monster of a Network…. You know how it is when you can’t make an Elsie meeting but wish you could? Or think of something helpful as you are on your way home? We have an online Elsie community where, each month, we will post brief descriptions of the various projects we have helped at the panel meeting, allowing you to catch up and post any ideas that you might have to contribute. You can also use it as a way to connect with other Elsie panel members, to comment on their ideas and generally do great things! It would be wonderful to see you in the community – but please remember we are just piloting this at the moment. However I am sure it might prove popular. Look forward to seeing you in the online community and hopefully at our next panel meeting too. The online community is great – but no substitute for getting out to the real thing! A Vision and Mission for Elsie…. 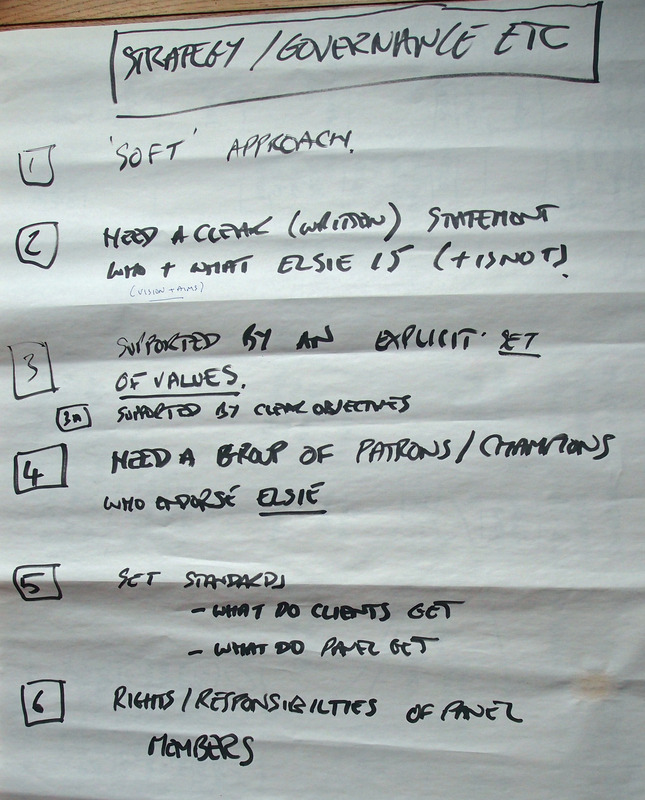 Here is a first stab at a draft vision and mission for Elsie following our recent development meeting. Please share your thoughts and responses. What have we missed? How can me make it more powerful? More appealing? More impactful? 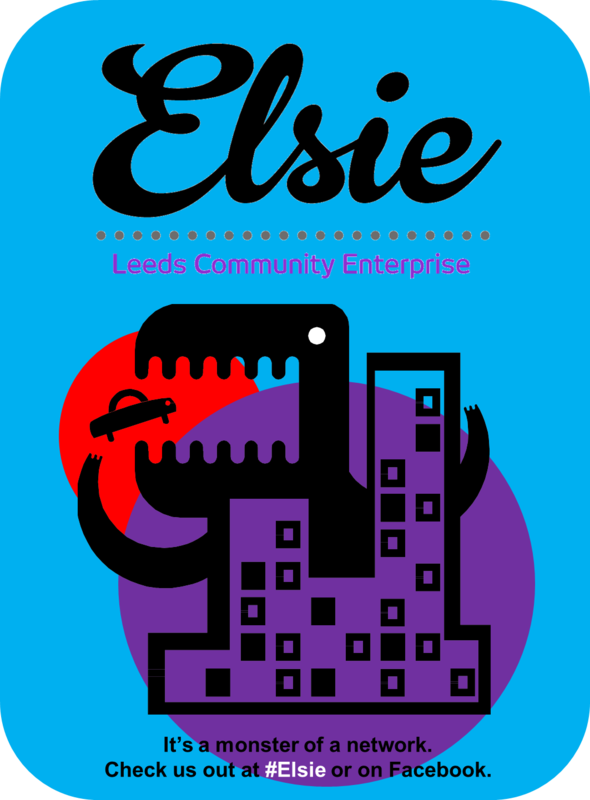 Elsie exists to help Leeds enterprises and projects of all kinds succeed, by providing free ideas and advice from a network of supporters. We aim to foster a culture of mutual support throughout the city by constantly growing the number of supporters and people we help. What Elsie Aspires to be About…. Yes I really enjoyed listening to the debate. Thought it was an excellent example of civic enterprise! Really good to see the efficiency and focus of the process. Supportive but challenging input. Obvious willingness of people to offer support outside meeting. Think it’s a great model. First of all a big thanks to the dozen or so of you who made it and to the couple who tried in vain! 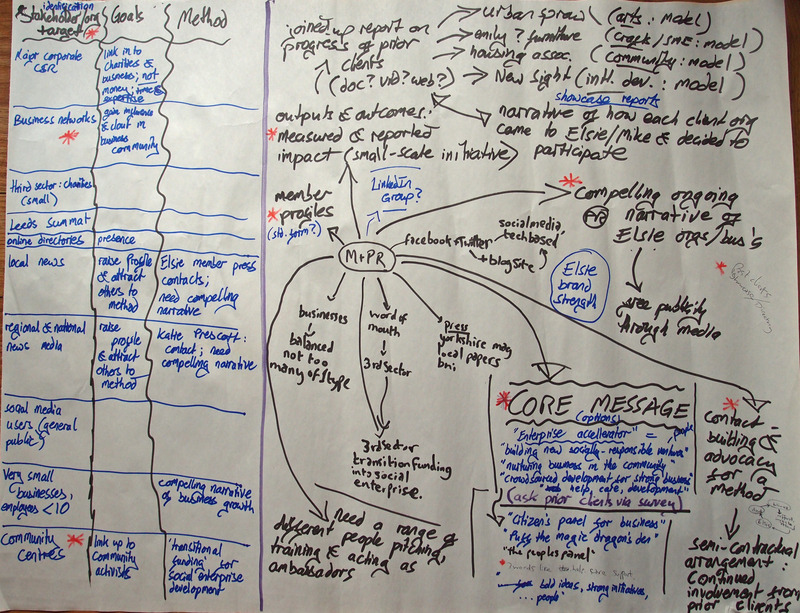 As a starter for 10 Mike offered the following mindmap. So main priority is to clarify vision and values. Soft approach suggests that at this stage we stay in a loose coalition of citizens format rather than go for a properly constituted group, although this remains a key decision to be taken. Can we realise ambitions for quality and growth, should they exist, without forming a legal entity? Anyone fancy having a stab at producing a first draft of any of these things? Vision and Values? Rights and responsibilities of members etc? Standards specifying what members and clients can expect from Elsie? So, once again, if I have got this right the main challenge is to revisit the core message. What is Elsie…, what do we do etc. Build a team of Elsie ambassadors so it is not just Mike berating people to help! Anything else big, important and doable that I have missed? Tess is already laying plans to shoot video witness testimony from both panel members and clients that can be published in both video form and transcribed. I am going back into wordsmith mode to develop values, vision, core message stuff…. Is there anything here that YOU fancy taking on? 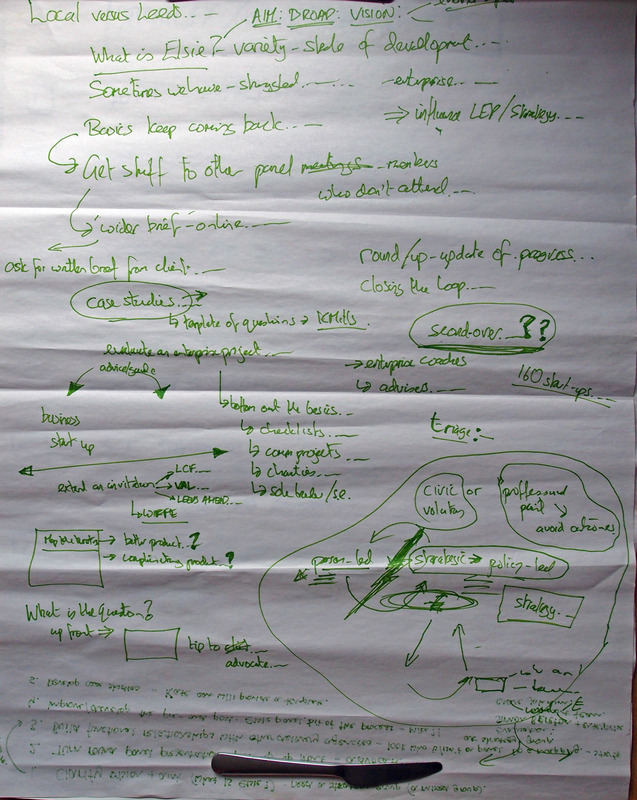 Strategy and Governance – plotting future developments – realising the vision…. To make this happen I propose that in September when we are 1 year old we should have a celebration at which we get to choose the people who might like to lead in each of these areas and help them to form ‘working parties of the willing’ to drive things along. I also think that we should elect an Elsie ‘Head Honcho’ with a one year term to help provide leadership and direction and ensure that the three working parties are co-ordinated and effective. This would provide the opportunity for more people to share in the leadership and development of Elsie, to learn stuff, develop skills etc and ensure that ownership was broad-based. We could make birthday party and election/re-election of ‘officers’ an annual celebratory gathering. Thoughts? Opinions? Party organisers? Many thanks again for the help today folks. If you missed and want to know more do use the comments box to raise questions or drop me an email.